So, in my new found running enthusiasm I replied to the club email saying I would attend the Intraclub relay on Tuesday night….. as Tuesday is my running night it was as much about catching up with my running buddies as is was about getting out to do a few km’s. I turned up at 6.30pm and saw a huge group of athletic looking ‘runners’. Oh my goodness, am I at the right place? On the right night? I located my buddies and worked out that I needed to give my latest Parkrun time – ekkkkk!!! I gave my time and then we all set off for a pratice lap of 1km – it was muggy and humid, but a nice route. On all getting back we were given our pairings. I was matched with Craig Bowles. Well he looked like a great match for me, he looked fast..!! I knew I would be one of the slower runners of the evening, but when apologising in advance to Craig, he reassured me with a smile that it was all about having fun, and not to worry. So, I set off as runner one, half way round I was chuffing like a train and thinking my goodness what did I sign up for? But with support from the lovely marshal, Tracy half way round I made it back to Craig and with a smile and enthusiastic hand slap it was over to him…. I grabbed my water and inhaler hoping for energy to be restored, but, before I knew it Craig was back. Off I went again, phew the next two laps were hard, it was a fast pace for me, but looking around, everyone was running at their hardest, and giving it 100%. I wasn’t going to let myself or Craig down so I ran on, doing my very best. Each time Craig was there waiting with his fist bump, ready to do his stint before handing back to me. The group of SJ’s at the change over area was increasing, the lovely Pure Beginner leaders and some PB runners also came to give their support, all clapping and cheering. I felt good in recovery, and each time I set off, I felt full of energy and ready for the next lap, but, it was tough keeping up that pace, and I started to flag half way round, but, the support of other club members was great, either running up behind with words of encouragement, or running towards me on the last stretch shouting, ‘great run‘, ‘keep it up’ or ‘well done’, was just what I needed. I was now on the last lap, I was determined to finish and doing OK, but getting slower, when one of my Tuesday night running buddies Ros Cosgreave appeared next to me and ran with me for a while which was lovely…. I was then on the last stretch…. just before I got to the end Ian Watson appeared and stayed with me encouraging me to sprint towards Craig….. WOW, people clapping and cheering with Craig poised and ready to do his stuff…… the final fist bump and he was off. 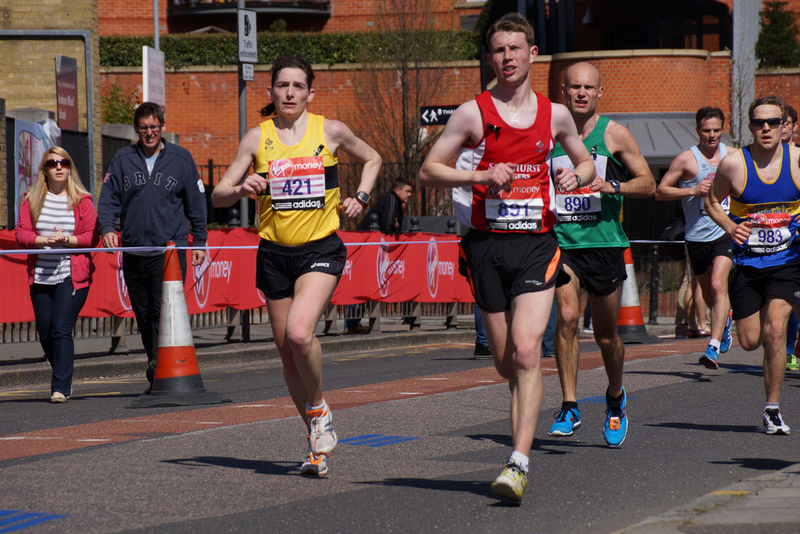 I was recovering, along with all the other runners around me, everyone had given it there all…. everyone looked exhausted, but smiling and laughing… asking whether it really was fun or not….. Then Craig came in sprinting, and looking like a true runner (how I ‘think’ I look when I run!! LOL ) He came over the line hand in hand with a fellow runner to cheers and claps from us all, and a hug from me. Each team had completed 10km. Well done everyone! ← 30th Anniversary Pub Run – Jackie Kent reports…. Hi Craig Not going to write a full blog as haven’t got the time I’m afraid or the written English skills!